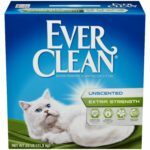 Best Cat Litter Mats Comparison & Reviews - Which Should You Pick? Looking for the best litter mat? To choose the best litter mat it’s a smart decision because they help keep the litter area clean for longer so the vacuuming or sweeping are reduced dramatically. They also form part of the decor in the house, offering shapes, colors, and textures that match the cat’s litter box and even the style of your house. 1. Catching the excess of litter from the cat paws when the cat walks on it. This is excellent for cats with furry paws. 2. Containing the litter when the cat jumps out of the litter box. The litter tracking is not only caused by your cat paws but it also gets spilled onto the floor from your cat jumping. 3. Helping as protection for a possible “accident” from your cat in the litter box area. 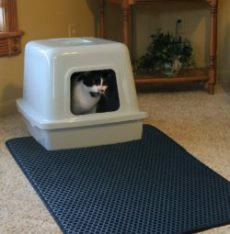 Most cats don’t do their business out of the litter box but the mat protects the floor in case your cat misses the right spot when doing its business. 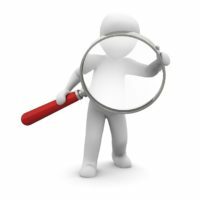 √ The litter you use: if you use sand type litter any good litter mat will work fine because they offer openings or rough texture to catch the litter. Some mats have small openings on the surface while others bigger holes. If you use fine litter it won’t be a problem for it to fall through the holes into the bottom layer. √ The texture: Ideally, the litter mat needs to be soft on the cat paws and also on your bare feet. This is very important because some cats refuse to walk on a rough litter mat when they don’t feel it easy on their paws. √ Functional design: To contain litter effectively, the mat needs to have some ridge edges to hold better the spilled litter. Also if you have a cat that jumps, the bottom of the mat needs to be non-slip so it doesn’t slide when the cat lands on the mat. √ Easy to empty: The mat needs to be easy to empty when filled up with litter and not too heavy if you want to dump the litter outside. 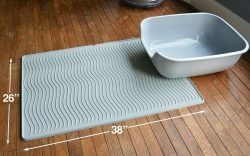 √ Size: The size of the mat is also an important point to consider because if you have a large litter box or a cat that does long jumps you might need a big size if you have enough room for it. 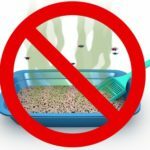 √ Waterproof: If your cat has frequent “accidents” with urine or feces, it’s a must to get a litter mat with the ability to hold liquids long enough until you take care of it. √ Easy to wash: The mat needs to be lightweight to carry to the sink, bathroom or outside to hose it off. Catching Litter System	 Double layer. Top layer with honeycomb shaped holes. Twisting vinyl fiber on top. Outer lip and grooves on surface	 Double laywer. Top layer with holes and little bumps. 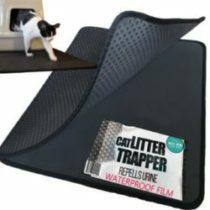 The Cat Litter Trapper has a double EVA foam layer where the top features honeycomb shaped holes where the litter falls through into the second layer at the bottom. The surface of the top layer has a texture that catches the excess of litter from the cat’s paws, reducing the litter tracking and the bottom layer holds the caught litter, keeping the area of the litter box cleaner. The mat features nylon mesh edges and a thin polymer film at the bottom back to make it waterproof. 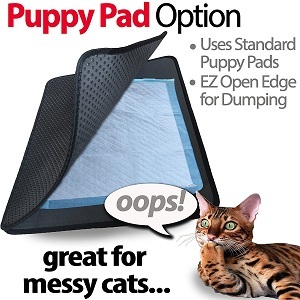 The mat is sewn only on one end, leaving the 3 sides opened for easy dumping of the litter. If your cat walks out the litter box without jumping. If you place the mat on a carpet. Smiling Paws Premium litter mat features a twisting vinyl texture with TM9 catcher technology that catches most of the litter from the cat’s paws. Your floors will be cleaner for longer and the frequency of cleaning the litter will be reduced dramatically. 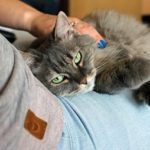 The size of Smiling Paws is extra large, covering a very extense area, ideal for cats that prefer to jump when leaving the litter box. Also, the surface is soft, easy on the cat’s paws so no problem for your cat to land on this mat. Also, the mat has a non-slid back which ensures the mat stability, it will stay put even on hard floors. Cats that jump when exiting the litter box. 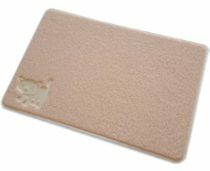 Petfusion ThoughGrip litter mat is made of FDA-grade silicone that is hygienic and soft on the cat’s paws. Its unique grooves on the surface and outer lip help to contain the litter, keeping it on the surface. The premium grade silicone is water-proof, not toxic and it’s anti-microbial. The material is sturdy and durable, with a design made mainly to catch excess of litter from the cat’s paws efficiently. As this mat is soft on the cat’s paws, the cat tends to walk on the suface of this mat, instead of jumping out the litter box, avoiding the contact with the mat. 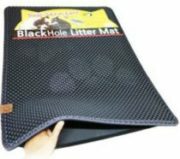 Blackhole litter mat is made with two layers of EVA foam, one at the top featuring holes where the litter falls into and the bottom layer where the litter stays until it gets emptied. The mat is sewn on both sides, leaving the two ends opened to dump the litter. The texture of the mat allows it to catch most of the litter from the cat’s paws. Blackhole mat is durable and non-toxic. The mat is not heavy, weighing 2 pounds. 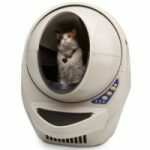 The double layer keeps the surface free of humidity in case of a litter box accident and it holds the liquids for a fair amount of time until you are able to clean it. You can’t go wrong by choosing any of these top cat litter mats to ensure a cleaner litter box area in your home. Good luck!